Harrodsburg City Hall is located at 208 South Main Street, Harrodsburg, KY 40330; phone: 859-734-7705. Photo: Daniel Curry House, ca. 1857, 414 North Main Street, Harrodsburg, KY. Listed on the National Register of Historic Places in 1989. Photographed by User:Nyttend (own work), 2010 [cc0-by-1.0 (creativecommons.org/publicdomain/zero/1.0/deed.en], via Wikimedia Commons, accessed June, 2015. Harrodsburg, first permanent white settlement in Kentucky, is on a hill of the Bluegrass just west of the upper Kentucky River. Set on a lawn facing the main street, the Mercer County Courthouse lifts a white clock tower and cupola high over the countryside. Around it hurries the vigorous life of this tourist city. Along College Street old families live in homes designed in early nineteenth century styles. Around the city in all directions cluster horse farms, tobacco farms, and chicken farms with their distinctive houses in the southern plantation manner. Harrodsburg's fine homes and mineral springs are less cherished than the historic shrines assembled here in Pioneer Memorial State Park. Kentucky looks to Harrodsburg for reminders of long struggles during surveying and settlement; and great deeds of men like James Harrod and George Rogers Clark are commemorated here. Early in 1773 Governor Dunmore of Virginia sent surveyors into Kentucky to survey public land, to be used in paying off veterans of the French and Indian War. One of these surveying parties, led by Thomas Bullitt and James Harrod, left Fort Pitt in the spring of 1773 and descended the Ohio River to the mouth of the Kanawha. Here the party met the McAfee brothers Robert, William, James, and George who had left Virginia on a similar mission. The two parties joined forces and continued down the Ohio River to Big Bone Lick, where they camped July 4 and 5. On July 7 they separated. Bullitt and his followers went to the Falls of the Ohio where they laid out the site of Louisville. Harrod accompanied the McAfees up the Kentucky River beyond the present site of Frankfort, where they crossed over into the valley of the Salt River. At its headwaters they located two proposed settlements, one by James Harrod where Harrodsburg now stands, the other by the McAfees a few miles north. They then returned to Pennsylvania and Virginia to plan for a migration in the following spring. Early in 1774 James Harrod and 31 other men returned to the site of Harrodsburg. On June 16, 1774, a settlement called Harrodstown was laid out near Boiling Springs, three miles east of the later Harrod's Fort. A half-acre town lot and a 10-acre out-lot were assigned to each man. All the men took shares, but only five or six cabins were built that summer. On July 20, 1774, while resting near a spring, four Harrodstown men were fired on from the underbrush. One was killed. Two fled through the woods to the Ohio River; they went down the Mississippi to New Orleans, and took ship for Philadelphia. The fourth ran to the settlement and told of the attack. The Indians were on the warpath! Early that summer they attacked surveyors and settlers north of the Ohio River, and Lord Dunmore sent Daniel Boone and Michael Stoner to order the return of Kentucky surveyors until the Indian war was over. By the end of 1774 the cabins at Harrodstown were deserted and few white men remained in Kentucky. While Daniel Boone, in the employ of the Transylvania Company, was blazing the trail across the mountains to the site of Boonesboro, James Harrod and 30 men in March 1775 occupied cabins built the previous year. On higher ground they constructed a palisaded village. It was a defensive arsenal and fortified town, the residents serving as a garrison ready to protect settlers living on the outside. Women and children arrived in September 1775. Late in the summer of that year, James Ray, a boy of 16, was hunting near the fort. He had just killed and roasted a blue-winged duck when a "soldierly looking" man stepped from the forest. The boy offered to share his duck. "The man seemed starved and ate all of it," Ray said later. The stranger asked a great many questions about the settlement, and Ray offered to lead him to the fort. In this way, according to old accounts, George Rogers Clark introduced himself to Harrodstown (later Harrodsburg), and became its leader. Besides the usual pioneer troubles, Harrodstown settlers soon faced the problem of proving title to their land. The Transylvania Company claimed a large tract of Kentucky land through purchase from the Cherokee. The company attempted to exert authority over the territory settled by Harrod and others. Clark called a meeting of the settlers in June 1776. The settlers authorized Clark and Gabriel Jones to go to Virginia to re-establish their claims. The two men set out over the Wilderness Trail, but in the Cumberland foothills were halted by an acute case of "scaldfeet." They were delayed just long enough to prevent their arrival at Williamsburg, Virginia, before adjournment of the assembly. Clark went to Governor Henry, who gave him a letter of approval to the council of state. A country not worth claiming is not worth protecting. Clark was then given the powder, with the assurance that Virginia would back him. As Clark returned to Kentucky he was hotly pursued by Indians along the Kentucky River and was forced to land at Limestone (now Maysville) to hide the powder. On the way to Harrodsburg he met a group of surveyors. They returned to the powder cache, recovered the explosive, and took it to Harrodsburg. Clark evidently conceived the idea of attacking the British in the northern territory either before or while he was at Harrodsburg, for he obtained permission from Gov. Patrick Henry to attack wherever he thought advisable. Harrodsburg people were industrious and thrifty. In 1775 John Harman raised the first corn in Kentucky in a field at the east end of Harrodsburg. The first woolen mill and the first gristmill in the West were operated here, and pottery, plows, flour, and textiles were manufactured. The first school in the State was conducted within the fort in 1778. The teacher had no textbooks, and the children used smooth boards for paper and juice of ox galls for ink. They learned to write and read, and studied the Bible and hymnals. By 1800 the community was prosperous. Rich farm lands surrounding the town encouraged cultivation of flax, hemp, tobacco, and other money crops. Harrodsburg's industries thrived. Then the development of roads to other Kentucky settlements and the coming of the steamboat in 1811 shifted Kentucky's major trade routes. Harrodsburg fell back on agriculture, and developed a tourist trade at first because of its sulphur springs, later because of its historic interest. Harrodsburg was the summer resort of plantation owners in the Deep South, and Graham Springs alone is said to have had more than a thousand guests at one time. Despite its industrial collapse Harrodsburg so profited from tourist business and marketing that the period 1820-1860 was one of steady growth. Log cabins gave way to more genteel houses modeled after the mansions on the Potomac and James Rivers. Bacon College was removed from Georgetown to Harrodsburg in 1839, and remained here until destroyed by fire in 1864, when it was merged with Transylvania College at Lexington. 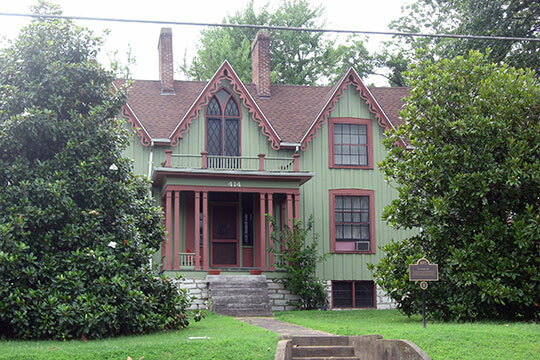 Greenville Female College, later known as Daughters' College, now Beaumont Inn, began in 1840. In 1847 there were two female academies: one, under the management of the Chris council offered to lend him 500 pounds of powder if he would defend and settle the country across the mountains. Clark refused, saying that a country not worth claiming is not worth protecting. Clark was then given the powder, with the assurance that Virginia would back him. During this period many men of distinction were born or lived in Harrodsburg. Gabriel Slaughter (1818-20), John Adair (1821-24), and Beriah Magoffin (1859-62) became Governors of Kentucky; George S. Houston took the same high office in Georgia. John B. Thompson was a United States Senator (1853-59). William Marcus Linney (1835-87) was a pioneer Kentucky botanist and geologist. This era of prosperity was seriously interrupted by the War between the States. Nearly all nearby farmers were slave owners. Their slaves were liberated, their fields laid bare, their livestock and horses taken, and their estates impoverished. Property built up through three generations passed into other hands. The family ownership of practically all the old homes of Harrodsburg can be traced back no further than 1870, when the population was 2,200. In the decades that followed, rehabilitation and growth were slow. Competition from imported sisal and jute, because of practically no tariff protection, caused the hemp industry to fail. Prices of grain were uncertain, and tobacco gradually became the chief money crop. Little by little, farms restocked sheep and beef cattle, and by 1900 Harrodsburg had regained some of its prosperity. During the last 30 years Harrodsburg has become the trade center of a farming region producing exceptional trotting horses, poultry, and white burley tobacco; its few industries operate on power furnished by the Dix Dam hydro-electric plant. Its tourist and resort trade is enormous. Throughout the warm season beginning in May, a number of people come from all parts of the country to "take the water" at its sulphur springs and visit its historic shrines.